This fall, the series Critical Studies in German Idealism (Brill Academic Publishers) has published a new volume, which I edited together with my colleague Sasa Josifovic. The volume explores Immanuel Kant’s description of the human conscience as an “internal court of justice”. Kant’s theory of conscience is discussed in the context of practical philosophy, philosophy of religion and its historical development after Kant, especially in Hegel’s philosophy. 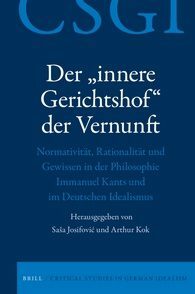 Approaching general concepts such as “normativity” and “rationality” from the perspective of Kantian philosophy and German Idealism, the book goes beyond the limited scope of contemporary theories of action that often take these concepts for granted. In particular, Kant’s theory of conscience invites different perspectives that are both critical and more fruitful. The book contains German papers by Klaus Düsing, Walid Faizzada, Sasa Josifovic, Heiner F. Klemme, Thomas Oehl, Elke Schmidt & Dieter Schönecker, Arthur Kok. Christian Krijnen, Paul Cobben, and Kurt Appel; and an English paper by Stefan Bird-Pollan.